We almost didn’t read this book. It looked boring. And old. And maybe I’m racist and sexist (I’m totally not). After reading hundreds of books together as a family with 3 little boys I literally judged this book by it’s cover and found it lacking a boy with a wand. But it was our last book for book club so we decided to just get through it and make the best of however it shook out. There is learning value in every experience, right? It is one of our favorite books of all time. The way the author weaves stories together through time and characters is masterful. The theme of choosing happiness through gratitude is one that resonated with all of us so deeply. This book really affected our core while always feeling natural and self discovered. 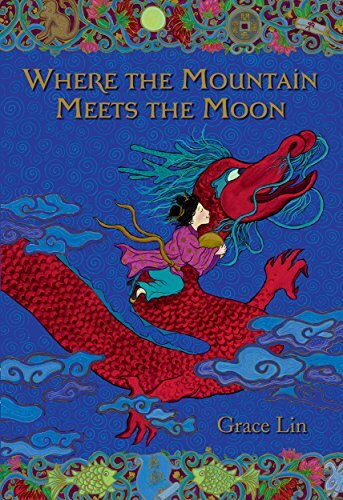 The discussion questions at the end were perfect and we especially enjoyed the personal section where the author described her process for evolving this story from traditional Chinese stories to her first hand experience traveling to China to her own cultural identity to what it became: Where the Mountain Meets the Moon – we were fascinated by every word. Add this to your family reading list. 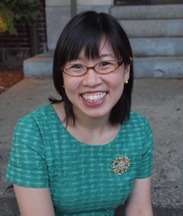 Grace Lin is a Newberry Honor Winner, National Book Award Finalist, and New York Times bestselling author.. 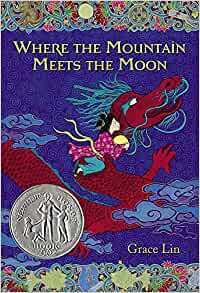 I just read this book again yesterday, because my daughter borrowed When the Sea Turned to Silver from the library, and I figured out pretty quickly that it would be better if I refreshed my memory on Where the Mountain Meets the Moon first. Both books are great, of course. This first novel was particularly enjoyable. It is so well-written; even the sentences that don't appear to be critical to the story are carefully crafted. The characters, whether human or not, come alive in the story and in the stories within the story. I love how all 3 books (including Starry River of the Sky) are woven together. There are many positive life lessons throughout. Definitely one of my very favorite children's books, and even among my very favorite fiction books. 5つ星のうち5.0One Book One School - great choice! We recently had this book for our K-8 school One Book One School. It could not have been a better choice. It's a wonderful story that weaves in lessons of courage, kindness and love. It has characters that are interestingly rebellious and a bit of magic and mystery. Grace Lin's story has both an large ark and then small somewhat updated adaptations of Chinese fairy tales. It's a wondrous mix. Minli is a heroic and sweet young girl who wants to change the fortune for her parents. She goes on an amazing journey through kingdoms and forests meeting all the types of people and animals and adventures that I personally would love to join. The ending is beautifully done. The story seems to accelerate to the last page. My children from ages 6 to 11 loved it. We will read her other stories. Well recommended for families that enjoy reading together.